The headline and first half of the blurb are true. The last bit--"in part because the plans come with serious trade-offs"--simply isn't. 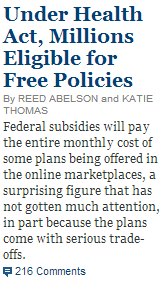 To the extent that the subsidies have been ignored, it's because the problems with the federal exchanges, and then Republican hysteria over the individual market, have attracted all the media attention and drowned out anyone who points out the law's many positive features. Most signs suggest the media doesn't actually understand the law very well and tends to report on it by looking at whatever aspect is generating the most heat at any given moment. It's a tiny thing but it's irritating because the Times is straight-out lying. It's lying to give itself cover for a journalistic omission. What really happened is that the paper, like the rest of the media, first focused on the (justifiable) bipartisan anger over the broken exchanges, and then focused on the (unjustifable) GOP anger over cancelled individual policies, and finally seems to be catching up with reality. But it won't say that, so instead it's made up a completely fictional policy rationale for a political phenomenon.